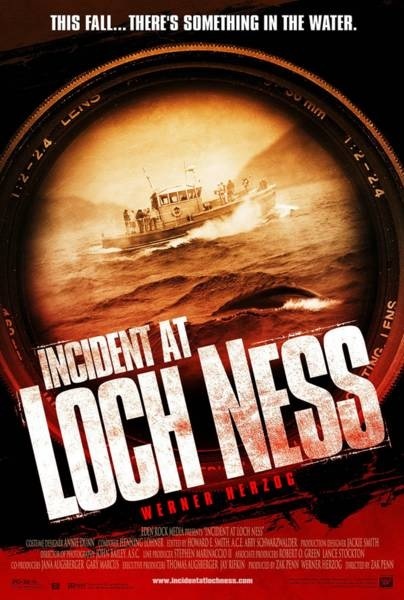 AICN COMICS Q&@: Ambush Bug Interviews Zak Penn and Scott Murphy about their new comic book HERO WORSHIP and geeks out with them about INCIDENT AT LOCH NESS!!! Zak Penn & Scott Murphy!!! AMBUSH BUG (BUG): All right, so let’s get started. I’m here with Zak Penn and Scott Murphy. 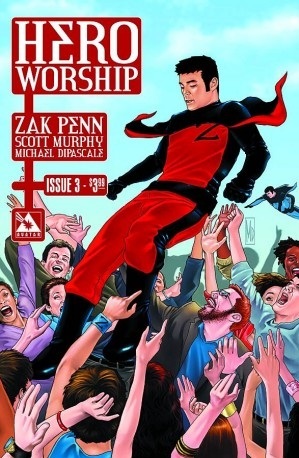 You guys have a new book coming out from them, it’s called HERO WORSHIP. Can you tell me a little about that? 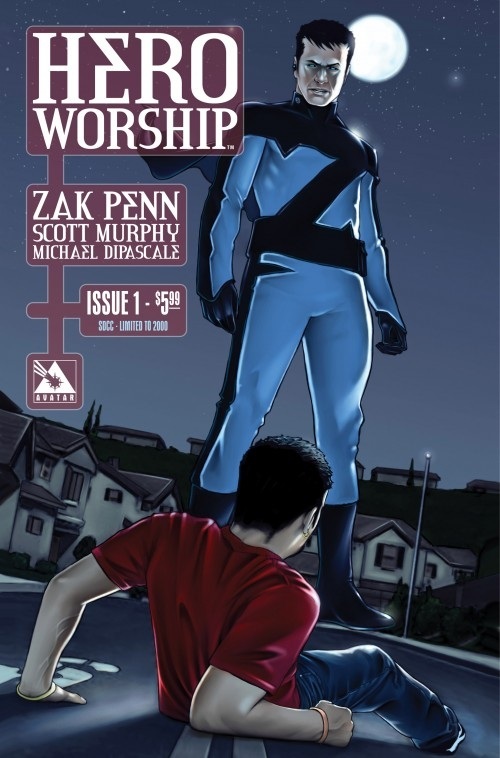 SCOTT MURPHY (SM): HERO WORSHIP is based on… I had an original idea a few yeas ago that I was messing around with and I thought I might write as a screenplay, but then it seemed like it would be better as a comic book and I had known Zak and we started collaborating on it and he had a lot of ideas that he had always wanted to do in a comic book and we ended up meshing our two ideas and came out with something better than either one of us had had prior to that. The idea for HERO WORSHIP is “What if there really was a super hero in our world that could do these miraculous things?” Wouldn’t he be like the largest celebrity we have ever seen in history? What sort of fan culture would sprout up around him? How would that impact our world? 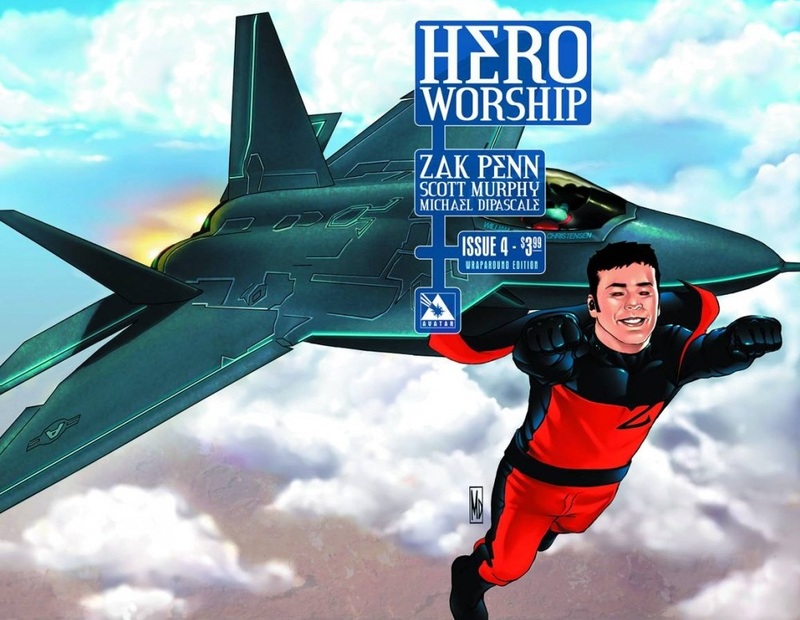 The story of the book follows one of the biggest fans, a kid named Adam and shows how he feels about Zenith and by the end of the first book he sort of crosses paths with his hero and the rest of the series will explore how that interaction progresses. 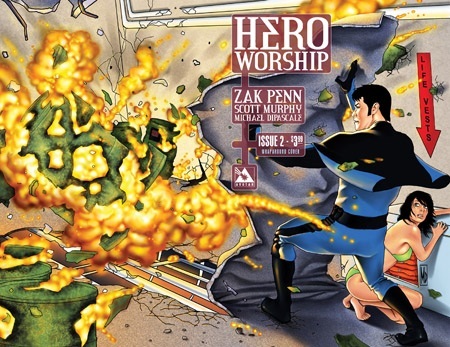 ZAK PENN (ZP): It’s basically dealing with the fact that this kind of worshipful tone that we take towards our heroes is obviously not based in reality. The guy is a real person. He is not perfect. He is far from it and actually as the comic book unfolds, how imperfect he is becomes clear. So it’s kind of in a metaphorical way a comic book about comic book fandom a little bit. There’s a lot of that element in it. BUG: I actually read the book last week and liked it a lot. What made you want to bring it to Avatar? ZP: Well the key thing is that Avatar gave us complete creative freedom. They basically said, “Write the book you want. Do what you want. We will publish it.” And for me I’m used to working on movies where I have a million people telling me what I can or can’t do, so that was really appealing and I think it’s the same for Scott as well. SM: Yeah, we actually took this idea out to quite a few publishers and we got quite a few offers from different places, but as far as having not only the best deal on the business side of things like William [Christensen, Publisher of Avatar], as Zak said, gave us total creative control and hooked us up with a great artist, Michael DiPascale. 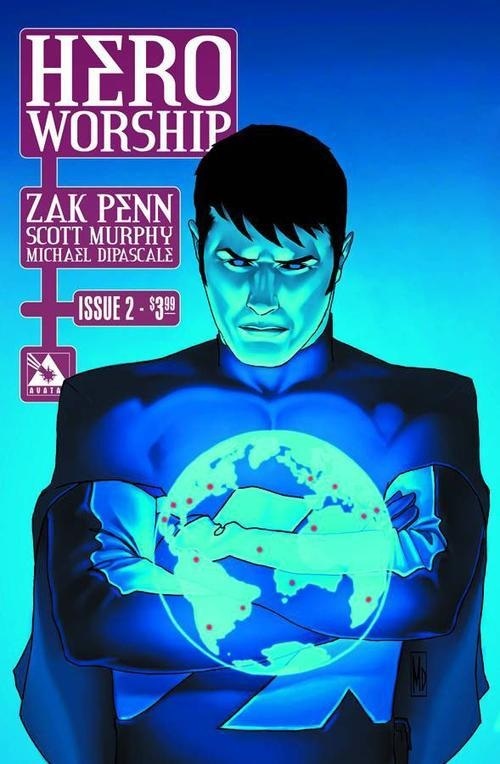 The other books that Avatar puts out are also tonally similar to what we were trying to do and we sort of wanted to do a book that commented on other superhero books and the take on a sort of traditional superhero story and that seemed to align with the kinds of things that Avatar did. BUG: You’re used to working with films with pretty big budgets, but with comics there’s really no limits to the budget. How do you adjust to that or has there been an adjustment? ZP: The scope has nothing to do with how much money is spent and that’s what I love about comics. I mean it doesn’t coast any more to do a shot like that where we are looking at a shot of Zenith flying into the sky pulling a crane. That’s one of the things that’s fantastic about it, the form. I always say this, the two forms of screenwriting and comic book writing are incredibly similar. They are probably far more similar than even writing a play. I mean I used to write plays and it’s just a totally different beast, but the way you write a comic book is so similar to how you write a screenplay. So for me it’s exciting to sit there and say “That building should be the size of the Taj Mahal and it should be in the middle of the desert,” it’s not a problem. We don’t have to go find the location. SM: Yeah, and we also get a lot more impact in the art work, where if you were writing a movie or a TV show you just get the footage back and then that’s kind of the footage that was shot, but here we could get the pencil drawings early on and we could suggest different things or help steer it visually more than we would have a chance to do in a film. BUG: So let’s talk a little bit about the artist. How did the artist become involved? Was that Avatar bringing them in? ZP: William brought us the artist. He showed us a bunch of different artists to try to find… That’s pretty much what happened and we saw Michael’s work. He showed us a bunch of different artists and we gave our two cents, but he really has guided the process for us, which is great, because that’s something that I don’t think either of us had enough experience with to kind of be able to tell “Is this guy going to be able to handle the workload?” So that’s all on William. BUG: How do you guys split up the duties of writing and creating this story? It’s a story by the both of you guys and scripted by you Scott, is that how it works? ZP: It’s designed to confuse you. Basically, it look it’s Scott’s idea. This was his idea that he brought to me and I see my role as helping him flesh it out and for some of the issues Scott and I sat there and kind of bounced the whole thing back and forth off of each other and collaborated fully and then when I went off to do ALPHAS, there were parts of it that Scott wrote himself and then I would give him notes and then we would both work on the visual part of it. I see my name bigger than Scott’s, but that’s not the way it should be. SM: That’s very generous of Zak to say, but Zak brought a ton of ideas back to the table after I had the initial version of this idea and it was very collaborative and we really bounced a lot of ideas off of each other and he would spin various ideas that I had and then I would do variations on those ideas, so ultimately we could look at a lot of the aspects of the comic and it’s not really clearly his or it’s not really clearly mine, it’s bounced back and forth between the two of us enough that it’s become definitely a collaboration between the two of us. BUG: Is this an ongoing? A mini-series? ZP: We’ve doe six issues that are already finished. By the way, for fans who are worried that a bunch of screenwriters won’t finished their mini-series, we have already finished it. All of the scripts are written and the comics are almost done, but the goal is to create a series. By the end of six issues there will be some closure, but it really is designed to be an ongoing saga, particularly if people buy it and read it. SM: That was an issue that we discussed with William at length. It took quite a while after we made the deal with William for the book to come out, because as you know there was a rich history of people from the film and TV industry coming in and dabbling in comics and then jumping ship after a couple of issues. Some of those people, like Daniel Lindelof and JM Straczynski have come back, but we wanted to make sure we could do ours straight through. So we’ve got a six issue mini-series that is definitely one complete story-arc. After that is completed, then we do have ideas for a further mini-series, so we could definitely do different installments in the future as this series takes off. BUG: And Zak, with your background in film, is this something that we might see on the big screen some day? SM: I think we are open to that possibility. ZP: No, I’m not! I mean Scott brought it to me originally as a screenplay and I said, “Yes, it would be a good movie, I mean there’s no question, but it would also be an amazing comic book. Once the movie gets made, the comic book will never be what we wanted it to be.” So I said “Let’s get the version that we want first down on paper,” but there’s no question… I wouldn’t have put all of the time and effort into it if I hadn’t also seen that… You know I love comics and I love to read them, but this was also an idea that I thought “This could really work for a number of reasons,” but I have to say it’s its own reward. Not to sound sappy about it, but there’s something really satisfying about actually being able to pick up the issue that is what you talked about all of this time and there it is, or the six issues, that you very rarely, unless you write and direct your own movie you almost never have that feeling. But yes, I think that you will eventually see the movie version of this. BUG: Very cool. You both are obviously comic book fans, is this the first comic book that you have made or have written yourself? ZK: Yeah, for both of us. BUG: As a fan of comics, what’s that like just to see your name on a comic book? ZK: I’ve got to be honest, I have gotten used to seeing my name on posters and in movie theaters, so I’m a little bit jaded about that. It’s more like when the art… For me, when the art comes back, that feels to me like when you’re watching the rough cut of a movie or the dailies from a movie where it’s like “Wow, here’s the thing we talked about and now it’s on the page. That’s the neighborhood in LA that I told the artist to use and it looks like that neighborhood.” So to me, that was the really satisfying thing, but you know the comic just came out. Maybe it will change as we go on. SM: Yeah, it’s hard… It hasn’t really sunk in yet. It’s starting to now, because we’ve just signed four or five hundred issues of the comic, so it’s definitely tangible now, but yeah I’ve been a comics fan since childhood and so seeing my own name on one of them is kind of a jarring juxtaposition and there’s some cognitive dissonance going on like “Okay, there’s a comic book which I’ve always seen as written by someone else, but my name is on it. 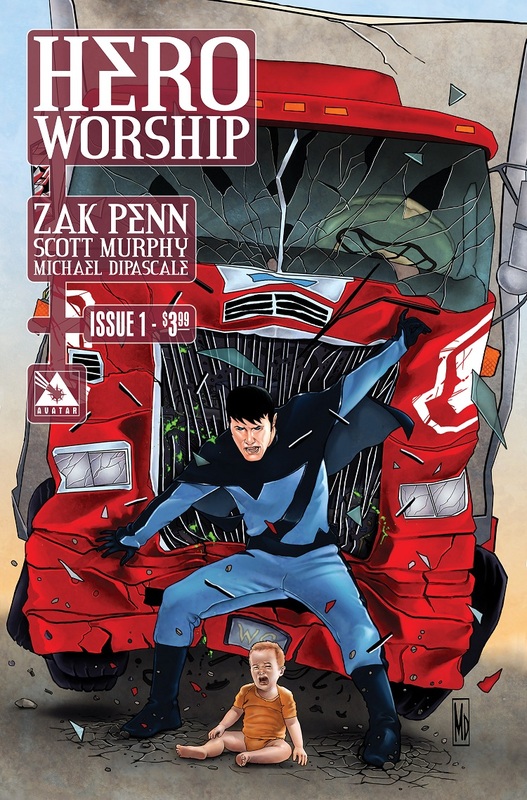 That’s all stuff that Zak and I have been working on inside it now.” So it’s definitely pretty thrilling and to be at places like Comic Con too where it’s kind of Mecca for comic book nerds like myself, it’s a great place to debut it. BUG: What’s the fan reaction been like so far? ZP: Pretty negative. I mean most people have hated it. [laughs] No, you know we’ve only… We haven’t gotten the chance to gauge much of it, because we just got here. I mean most people seem to be positive about it so far. I mean it’s weird for me, because it’s just one issue, so it feels to me like you need to read a couple before you can get a real answer, but the people who have read the first few seem to like it. I don’t know, in general people seem to be pretty into it. SM: The book’s only been out a month and it’s not based on a previously existing character and so it really feels like we are sewing the seeds now and trying to generate groundswell of support for it. ZP: Right, it’s not like when AVENGERS comes out the reaction is pretty immediate, you know there’s millions and millions of people, so I’ve kind of tempered myself to feel like it’s going to take a while. It’s like a cult TV show. It’s going to be a while before we really get a sense of what people think of it, you know? But importantly we are happy with it and that’s not always the case. SM: The first issue sets up a lot of things that are going to play out over the course of the first six issues and so there’s a lot of setup and so we really were just trying to get people interested as subsequent issues come out there will be a lot of “ah ha” moments and “oh…” and payoffs of stuff that we’ve stared to set up already. ZP: Yeah, and then people will really not like it. BUG: Well Zak when I heard that I was going to have a chance to meet with you, obviously your previous films that are all over the place, all of the superhero films and everything, I was really excited to talk to you about that, but what really interested me was the fact that INCIDENT AT LOCH NESS was probably one of my favorite movies in the last I don’t know how long, but I just love that film. I watch it over and over. ZP: First of all, Michael Karnow who played the crypto-zoologist is standing right over there. BUG: Oh really? Very cool. ZP: Yeah, he doesn’t have a beard anymore. He and I created ALPHAS together. BUG: I just love that film because of the dynamic between you and Werner. How did that film come about? ZP: Well first of all I will tell you that now you are my favorite Interviewer ever. That’s a movie that’s very near and dear to me. I mean that’s the one… of all of the movies I have made, that’s the one that is closest to what exactly I had in my head and I’m very proud of it. I had had a pretty disparaging experience on another project and if you watch the movie as a metaphor for the filmmaking process, then I think it works. I always tell people that the scene where I tell them to take the engine out of the boat and put a smaller engine in is literally from real like. I was in a meeting where they were like “Take the plot from this movie and put it in your movie.” So it came out of that frustration, but it was also that I had been writing with Werner Herzog. We were working on RESCUE DAWN together at the time and he’s my hero and has been for most of my life and it just suddenly hit me. We were in this place in LA and I said, “What if we went to Scotland and made a movie about the Loch Ness monster?” It was one of those things where I had a bigger idea, but he said “Okay, let’s do it.” And three months later we were there and it was just one of those things where you are like “This is insane.” My wife was like “What are you doing? You are playing yourself, but you’re a total jerk in the movie.” It was one of those things where we just did it and took a chance and I look back and I kind of can’t believe I actually got it done, but I appreciate it. I mean I’m always psyched when I run into people who have seen it. BUG: It’s a fantastic movie and exactly what you were talking about, about just the studio versus artistic spirit and how that is often such a battle. ZP: Also look, anyone who makes a movie with Werner Herzog is going to look good. I’m glad that people have listened to me, like I know he’s in JACK REACHER now, I mean you put Werner on screen and it’s going to be interesting. Pretty much I could have just filmed him buying razor blades and going around LA. BUG: I loved those scenes! I was completely fascinated just watching him do these mundane things. ZP: Me to. By the way, I remember he said to me “Nobody is going to be interested in this banality.” I mean some of it is even in the movie, but he didn’t understand. He was like “Why would anyone want to see this?” I was like “Werner, the juxtaposition of you doing anything is interesting.” But thank you, I really appreciate it. BUG: Well yeah, it’s a fantastic film. One of my all time favorites. ZP: It’s just coming out in the fall. It actually just got rebought by Summit, so they are going to re-release it I believe. I mean not in theaters, I think they will re-release the DVD and stuff. BUG: Great. I can’t wait. I’ll be first in line to pick it up. Well, you guys, thank you so much. Is there anything else you want to tell the guys at Ain’t It Cool News about HERO WORSHIP? 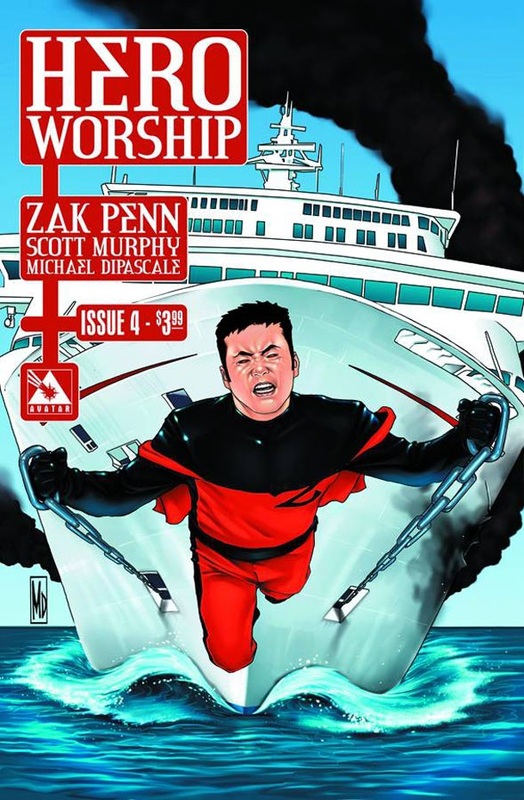 ZP: I would say read it and it’s designed to not blow everything in the first issue, so we really hope fans will give the mini-series a full read, because I think they will really appreciate where it goes. SM: I think fans of Ain’t It Cool will probably appreciate it on a different level than just your average reader, because it is about fandom and about fan culture and about how all of those things sort of interact with heroes and celebrity and a lot of different things besides just having an interesting superhero story. I think the Ain’t It Cool audience is an audience who would really get it. BUG: I can’t wait to see where it’s going to be going. Congratulations guys, thanks a lot. And best of luck! ZP: It was a pleasure. 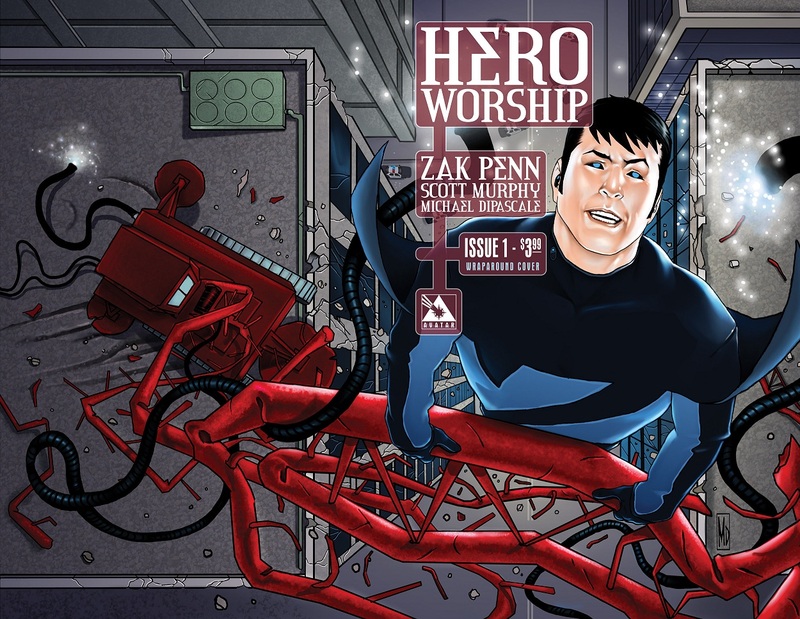 BUG: HERO WORSHIP by Zak Penn and Scott Murphy is in stores now. Be sure to pick up this excellent read from Avatar Press! Ambush Bug is Mark L. Miller, original @$$Hole/wordslinger/reviewer/co-editor of AICN Comics for over ten years. He has written comics such as MUSCLES & FIGHTS, MUSCLES & FRIGHTS, VINCENT PRICE PRESENTS TINGLERS & WITCHFINDER GENERAL, THE DEATHSPORT GAMES, WONDERLAND ANNUAL 2010 & NANNY & HANK (soon to be made into a feature film from Uptown 6 Films). 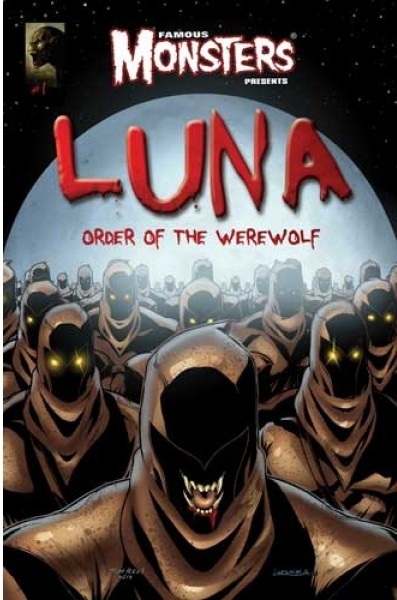 He is also a regular writer for FAMOUS MONSTERS OF FILMLAND & has co-written their first ever comic book LUNA: ORDER OF THE WEREWOLF (to be released in late 2012 as an 100-pg original graphic novel). Mark has just announced his new comic book miniseries GRIMM FAIRY TALES PRESENTS THE JUNGLE BOOK from Zenescope Entertainment to be released March-August 2012. Also look for Mark's exciting arc on GRIMM FAIRY TALES #76-80 which begins in August 2012.